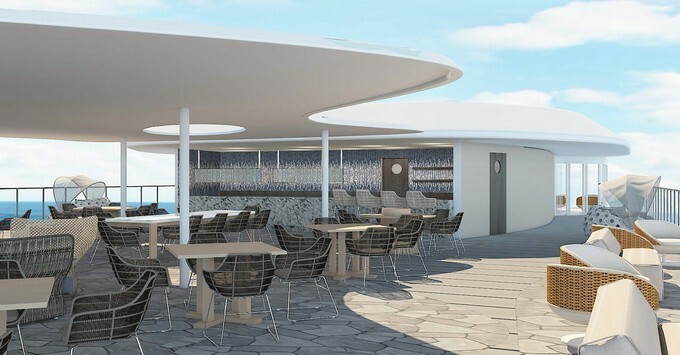 (11 a.m. EST) -- In a first for any non-expedition-focused cruise line, Celebrity Cruises will build a new cruise vessel custom-designed for sailing the Galapagos archipelago. 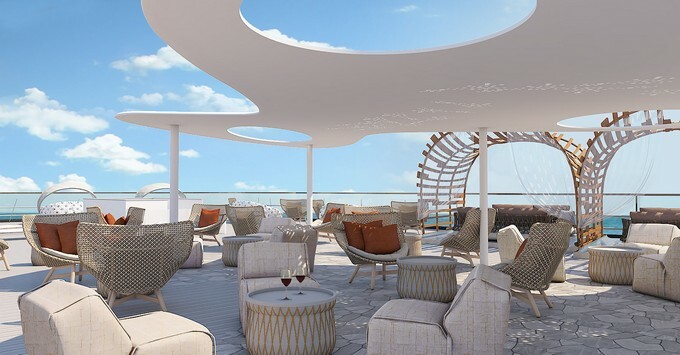 Debuting May 26, 2019, Celebrity Flora will be a 100-passenger, all-suite vessel featuring floor-to-ceiling glass windows throughout, the latest in environmentally-friendly operating systems and all the comforts Celebrity cruisers expect from the line. "Expansion in the Galapagos is really important to Celebrity," Lisa Lutoff-Perlo, president and CEO of Celebrity Cruises, told Cruise Critic. Celebrity has been sailing in the region since 2004, but while the cruise line has previously used older, refurbed ships for its Galapagos fleet, new hardware made more sense this time Lutoff-Perlo said. The two most recent additions to the line's three-ship Galapagos fleet came when Celebrity purchased local operator Ocean Adventures -- more for the medallions needed to operate ships in the area than for the ships themselves, which are significantly smaller than the line's Galapagos flagship, Celebrity Xpedition (16 and 48 passengers versus 100). "Those two ships aren't in our long term strategic profile for the Celebrity fleet," Lutoff-Perlo said, mostly because the line is not able to provide the full Celebrity experience cruisers expect. She also said the best way for the line to provide a consistent experience is with its own hardware and that, by building a new ship, Celebrity is able to take advantage of the latest environmentally-friendly marine technologies, as preserving the Galapagos is important to the line. Celebrity Flora will feature environmentally-friendly systems, including anchorless technology (Dynamic Positioning) that can maintain a ship's position while also protecting the sensitive sea floor. The ship will be energy-efficient with a 15 percent reduction of fuel consumption and fewer air emissions, thanks to an advanced propulsion system, unique hull configuration and specially designed diesel engines. The ship will also feature the ability to convert sea water and air-conditioning condensation into fresh water, as well as provide in-room water filtration stations for even further purification. Notable spaces onboard will include those reserved for dining, enrichment, relaxation and outdoor activities, and many of the suites onboard will make use of the line's innovative Infinite Veranda concept, which gives cruisers the option to have an indoor sun room space or open the windows for a French balcony experience. Breakfast, lunch and dinner will be served daily in the Seaside Restaurant, while the alfresco Ocean Grill will offer a casual dining space with panoramic views and the option to dine under the stars. Cruisers will also be able to opt for room service. Passengers will find displays of Celebrity's environmental efforts in the Deck 3 Naturalist Center, while the Discovery Lounge on Deck 4 will be where naturalists give presentations and introduce excursion information. At night, the lounge transforms into an entertainment venue with full bar and stage. The Observatory on Deck 7 is the place to learn more about the Galapagos islands in a library stocked with books about the wildlife and history of the region. The space will be wrapped in floor-to-ceiling windows for stunning views of the environs, plus comfy chairs and tables that will make it an excellent place to just sit and watch the world go by. 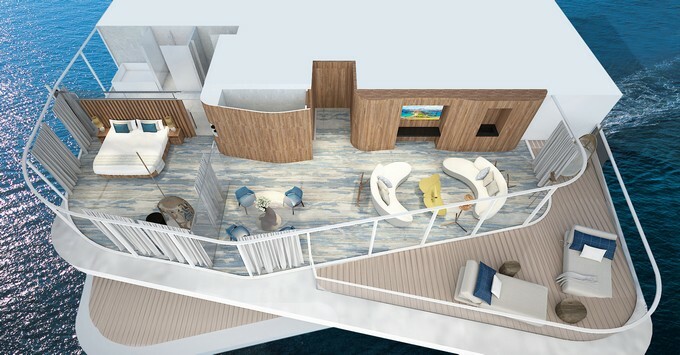 Located on Deck 3, Darwin's Cove will house the Guest Relations area and serve as the spot for cruisers to find cold towels, infused waters and other refreshments. This is also where passengers will find the naturalist team during the day to ask about activities or to talk more about Galapagos. Celebrity Flora will be an all-suite vessel, with 50 rooms featuring oversized bathrooms, Infinite Verandas (which are being introduced on Celebrity Edge) or actual balconies and personal suite attendants. Suites will be decorated with sustainable, regionally-inspired materials. The ship's two Penthouse Suites will each be 1,288 square feet in size with separate bedroom and living space, customizable lighting and shades. The bedroom will feature a king-sized bed and floor-to-ceiling windows, while the sitting area with have a flat-screen TV and comfortable chairs. The bathroom in the Penthouse Suites will have a spa-like shower, a double vanity, separate toilet area and spa tub that faces one wall of floor-to-ceiling windows. The private 321-squre-foot balcony will feature chaise loungers and a telescope for stargazing or wildlife spotting. There will also be two 559-square-foot Royal Suites, each with a separate living area, bedroom and 129-square-foot balcony, with similar layout and furnishings to the Penthouse Suites. 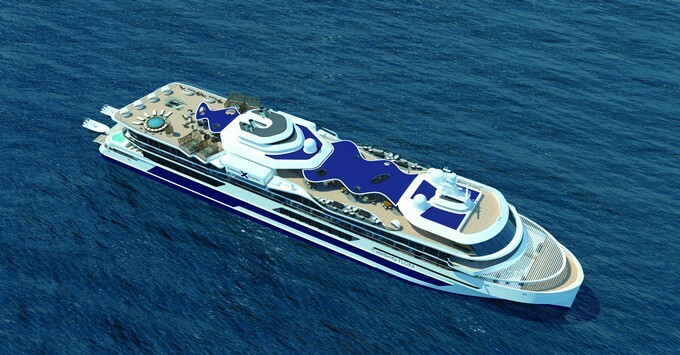 One-of-a-kind on the ship will be the 365-square-foot Ultimate Sky Suite with Infinite Veranda. The modern layout of the space features a glass divider with a coral-like design separating the bedroom and bathroom into two distinct spaces. The bedroom will have a large flat-screen TV and king-sized bed that faces outward, while the bathroom will feature a glass-enclosed spa tub and shower that faces the floor-to-ceiling window. There will be seven slightly smaller Premium Sky Suites (337 square feet each) with Infinite Verandas and 16 330-square-foot Sky Suites with Infinite Verandas, both with nearly identical layouts to the Ultimate Sky Suite. Finally, there will be 22 Sky Suites with balconies. These 330-square-foot rooms each feature a 75-square-foot balcony (with lounge furniture and table) and king-sized bed facing the floor-to-ceiling windows. The bathroom will have a large vanity with two faucets. Cruisers looking to unwind after a day exploring the islands can do so in several venues. The Vista will be an open-air lounge with 360-degree views, cocoon-style loungers, private cabanas and a Jacuzzi, while the Sunset Lounge will be a place to unwind with a plunge pool, chaise lounges and tables for unwinding with a drink and a small bar at the back. The Marina will be the primary point of access to the ship and will accommodate up to three Zodiacs for easy loading and unloading of passengers. It will also have a supply area to house all the equipment -- including wet suites, fins, masks, snorkels and life vests, as well as a rinsing station -- for outdoor fun. Additionally, there will be a Stargazing Platform on Deck 8, complete with telescopes for late-night astronomy lessons. Celebrity Flora will sail year-round from Baltra on alternating seven-night inner and outer loop itineraries. Celebrity Xpedition, which has traditionally sailed these itineraries, will take over those currently operated by the line's smaller vessels Celebrity Xperience and Celebrity Xploration. Whether these ships will remain in the Celebrity fleet has not yet been decided.